The prestigious award was assigned by the important german portal HRS. New Initiative for Corte Castelletto. Festival Italo-Irish from 03 to 06 May 2012. Sponsored by IRISH WRITERS' CENTRE and by the town of NOGAROLE ROCCA. We have received, from the Website hotel.info, an evaluation of 8.9 out of 10 points from the customers. 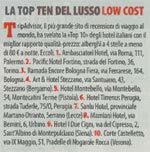 According to a ranking by the Tripadvisor’s website based on the reviews of travelers, and also published on the weekly magazine “Oggi”, Corte Castelletto is on 10th place of all the hotels from Italy, on the “Top Ten Hotels From Italy” with the best value Quality-Price!!! Corte Castelletto was judged "Hotel Very Clean" by customers all over the world, on Venere.com. Corte Castelletto is rated Excellent by TripAdvisor travelers.